One of the great stories from the golden age of mountaineering is the account of the first near-ascent of Denali, the highest peak in North America at 6190m. Late in the 19th-century, the blanks in the far-northern territories of the continent’s map were being filled in, and after some controversy – the Canadian authorities claiming for awhile that puny Mount Robson took the honours – it was established that the imposing Denali (“Home of the Sun”) was the highest by some margin. In true colonial fashion, it was renamed Mount McKinley and various expeditions set their sights on the prize. After months of effort, a serious attempt by Dr Frederick Cook in 1906 proved fruitless, and it was indelibly tainted after Dr Cook’s summit picture was proven to be a fraud. In the meantime, a $5000 award was placed on the summit, and this led to Tom Lloyd and Billy Taylor assembling a team of miners and trappers in 1909 “to show that ponce (Cook) who’s boss”. This ragtag crew was named the Sourdough Expedition after the hard bread the miners ate. It took them 11-weeks to get to the head of Muldrow Glacier, from whence the assault on the mountain began in earnest. With crude, home-made equipment they made their way up the mountain’s icy flanks, cutting almost a mile of steps to set up the final push. As the number of fit-and-able expedition members dwindled in the harsh conditions, Peter Anderson and Billy Taylor led the final charge, dragging a 4m flagpole and Old Glory through hip-deep snow and bitter chill. They heroically made the North summit, unbeknownst to them slightly lower than the true (South) summit, and planted their flag. Upon their return their story was disbelieved and ridicule followed them for some years. 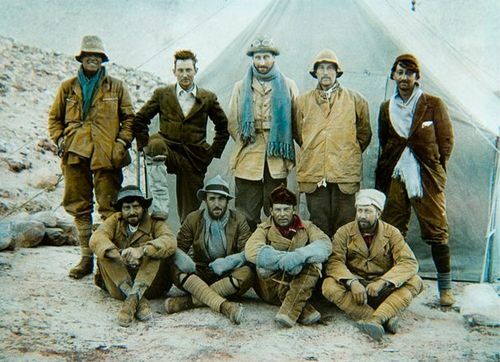 On 7 June 1913, the professional and well-equipped Karstens-expedition gained the South summit, from where their gaze fell upon the tattered remains of an old flagpole still planted on the North summit, thus vindicating the Sourdough Expedition’s bitter-sweet legacy. I have the greatest of admiration for these men of yore who ventured into the unknown with mostly frozen bread and scant equipment. I, however, enjoy the safety and comfort afforded us with modern equipment and good food, and am of the belief that those who wish to test their limits do so by going faster, unsupported or traversing near impossible terrain. My first multi-day hikes were done on 2-minute noodles, pre-mix pasta & sauce, large amounts of biltong, dried fruit and jelly babies. I managed just fine with energy levels but heartburn normally hit around day 3 (I later learnt that the combo of lots of salt & dried fruit is to blame), and on the longer 5-day hikes my body started to scream for something fresh. Nowadays eating is one of the highlights of any hike for me, and although I carry a bit heavier than most, I would say the effort is worth it. It is both a science and an art to pack the right sustenance, and it will differ from person to person due to individual taste, allergies and intolerance, as well as the weight you can carry. It will also depend on the number of days and distances you walk, the climate and temperature, and the proximity of grocery stores. Packing food is a balancing act between weight, taste, nutrition, cooking-time and freshness. Dinner on day 4: spinach & feta filled ravioli, a 60gm mature cheddar and a handful of cherry tomatoes. I rarely stick to the schedule but the main advantages are that I don’t forget stuff, and that I have neither too much, nor too little. I normally pack a day’s extra food on wilderness hikes where unexpected circumstances may require you to spend an extra day or two in the wild. Torres del Paine 2012. An enormous wildfire forced us to turn around and change our 10-day trek into a 12-day one. This was all we had left for lunch on day 11. The most basic principle is to pack food that has high energy but low moisture content, which will render it light and long-lasting. One can buy entire freeze-dried meals that will turn into a steaming plate of food after boiling for a few minutes. Going with only the lightest food may bring about nutritional deficiencies, in addition to having generally boring meals. What works best for me is to pack a mix of proper lightweight foods (like rice crackers or freeze-dried meals), some low-moisture foods (like biltong and dried fruit) and then some fresh / rich foods (like avo or cream cheese). 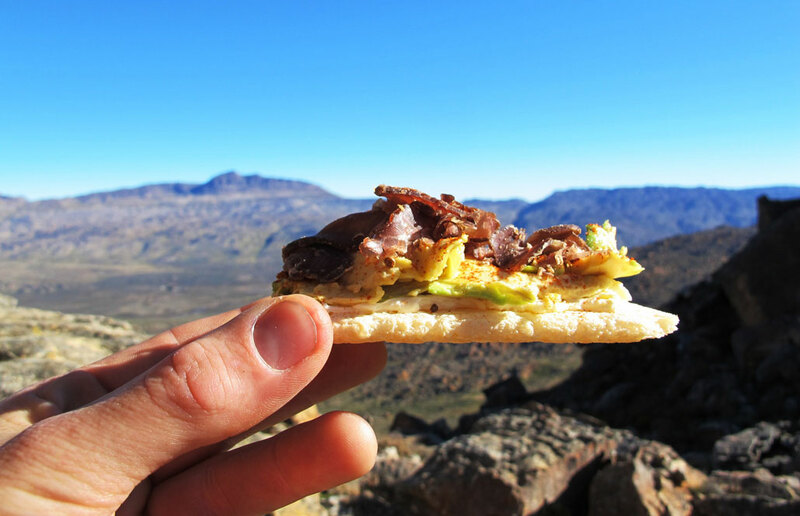 The Sneeuwberg –Toasted rye cracker, cream cheese, avo, biltong & a sprinkling of cayenne pepper – a snack named after its namesake in the background. 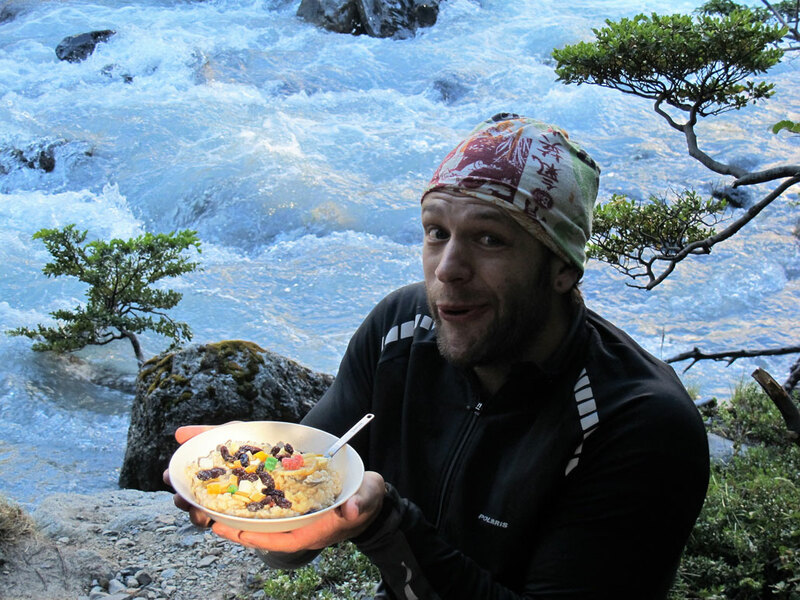 It is a myth that hiking food has to be boring and tasteless. 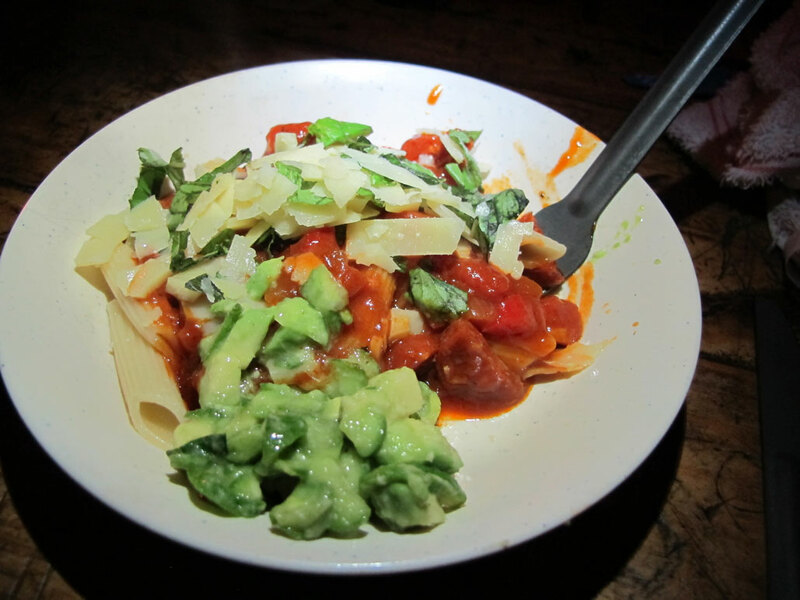 Being creative and adding a few luxury items to your grub can turn even two-minute noodles into a feast: mix in some aged cheddar cheese, fresh chillies & garlic; a bit of olive oil and/or olive pesto. 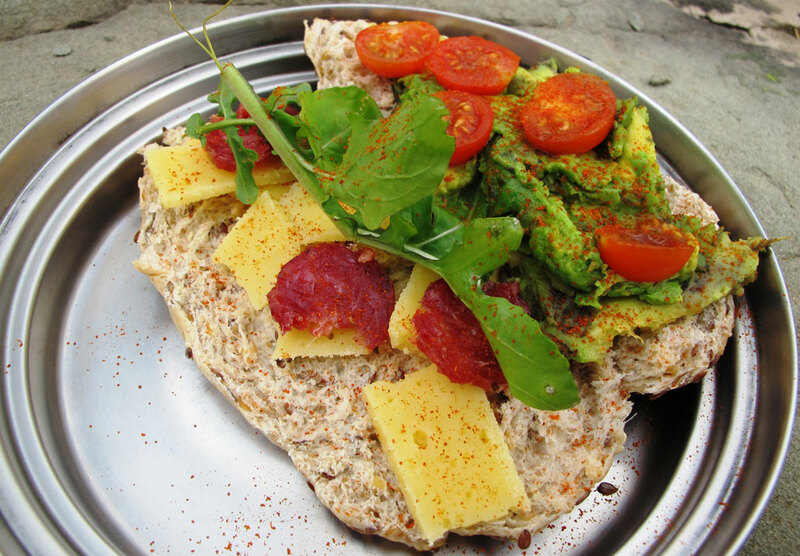 Or a plain cheese & salami sandwich can come alive with some added avo, cherry tomatoes & fresh rocket. Breakfast – whole grain rusks, oats, Pro-Nutro / Future Life. Lunch – whole-wheat rolls, rye bread, rice cakes, toasted cracker bread, pro-vitas etc. Dinner – pasta, noodles, couscous, quinoa (great for gluten-avoiders), quick-cooking rice, baby / sweet potatoes, braai-meat for night 1 (and 2) where one can. Oats made with glacial melt-water. Dried fruit & nuts to make it even more amazing. Flavour – pesto in a re-sealable container (olive, basil, Mediterranean etc. ); garlic and chillies (fresh or dried); a bit of olive oil; decanted olives; anchovies. Fresh basil will last 3 or 4 days in mild weather. Don’t forget salt & pepper! Cheese – processed cheese wedges; vacuum packed cheddar, hard cheese like Gruyere for long distance trails. And my most recent discovery: a tub of cream cheese. 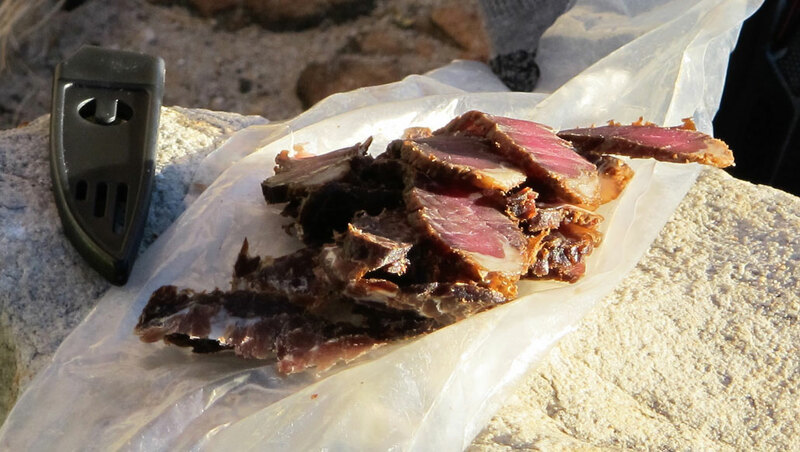 Meat* – on many trails one can pack a frozen and/or vacuum-packed steak / boerie / kebab (wrapped in newspaper for insulation) for a “braai” on the first night. The longer-lasting options such as smoked chicken breast, salami, ham, viennas & German sausages (vacuum packed) etc. are all good options that will last 4+ days in cooler temperatures. Chorizo is a great long-lasting addition to any tomato-based pasta, adding delicious flavour to meals that could be quite plain otherwise. The freshness – cherry tomatoes (in Tupperware), avocado pears (also in Tupperware), carrots, an apple or two, a small cucumber, watermelon (whole). Okay, just kidding about the watermelon….but you would be somebody’s hero though. 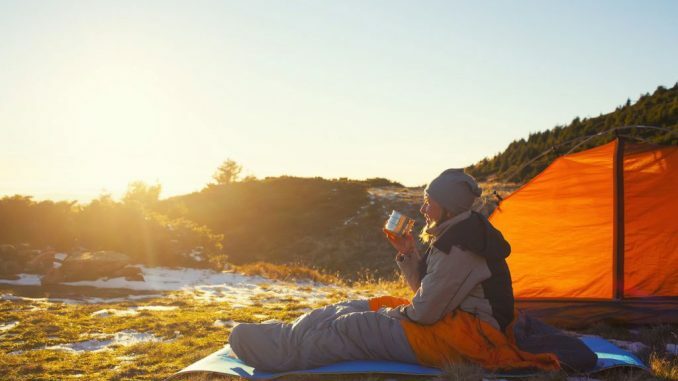 The Treat – if you are up for it and it’s not too heavy, it’s sometimes worth packing a ‘treat’ deep into your bag for the last night, for example tinned peaches and condensed milk, a slab of chocolate, marshmallows, or even a tot of whiskey or fortified wine. After days of plain fare, your friends will be amazed – I’ve often seen renewed strength in the eyes of the hopeless after whipping out some small luxury at the end of a long hike! *It’s important to note that in hot or humid climates meat can go off quickly, even if it is smoked or in sealed packaging. Always check the colour, smell and texture of the meat before eating it. A greenish tinge, sulphurous smell or slimy texture indicates that the meat has turned and it is definitely not worth eating – rather dispose of it! There’s a million options. Beware of too much refined sugar – look for fibre-rich options like dates and muesli bars. Dried fruit, nuts & peanuts, dates, jelly-sweets, chocolates, oat / muesli bars, biltong / droë wors. Coffee, tea, milk powder / cremora, hot chocolate, powdered energy / electrolyte drink like Game. Night-cap of choice. Breakfast and dinner is normally eaten at the hut or campsite. 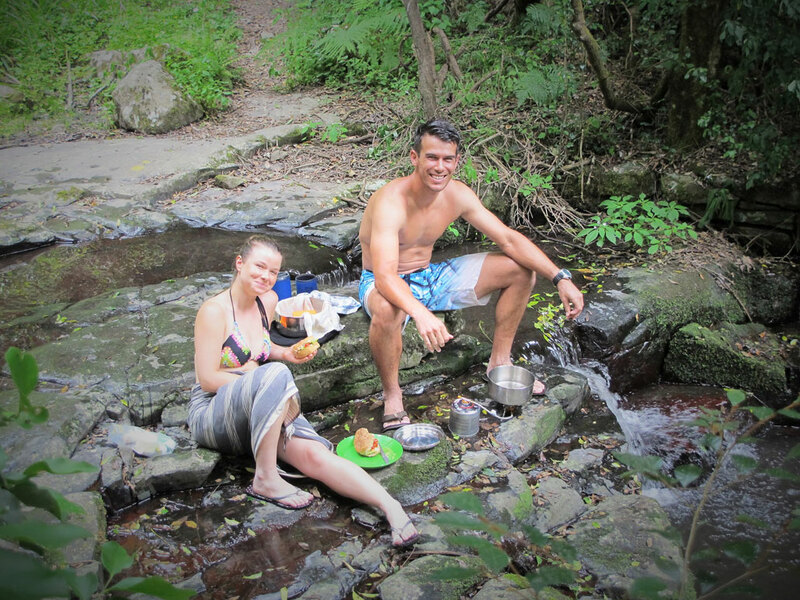 A daily highlight for me is lunch – find a beautiful spot, preferably next to a stream, take your shoes off, bathe your tired feet and have a swim if possible. Whip up an amazing lunch. Chat. Swim again. Have some coffee. Hit the trail. 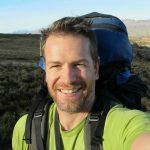 In this three-part series I have touched on just about everything one could conceivably need for a multi-day hike. 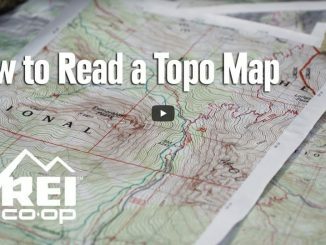 You will rarely need all of this, and there are several personal, trail specific and external factors that will guide your packing. The number of days hiking and the longest stretch of days between shops / settlements. Sleeping in huts, or taking your own tents? If in huts, are there mattresses? Is it rocky, slippery or sandy? It is often a combination of all! Are the paths clearly marked and do you have a map? Are there any river / ice / glacier crossings? Is there any dangerously steep terrain? 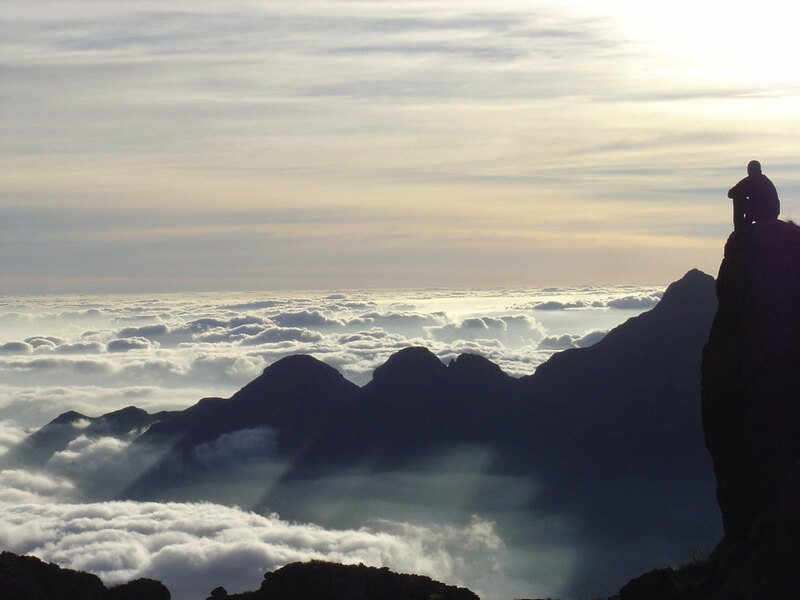 The highest altitude you will gain and your highest sleeping point. The time of year and the weather forecast. Dangerous animals and insects that inhabits the area. The big numbers – what’s your monetary and weight budget? My second “big”, and ultimately seminal, hiking experience was in the Drakensberg during June 2004. 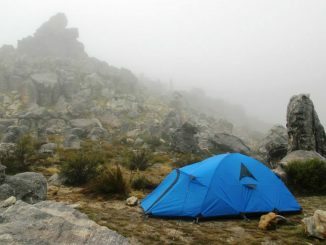 It presented a challenge that I had no frame of reference for: 5-days in the wilderness, no huts or marked trails and temperatures ranging from a pleasant 18-degrees in the day to minus 10-degrees at night. Snow was a real possibility. I was lucky enough, however, to be part of a group that had many years of Drakensberg hiking experience. At the time I had about a quarter of the hiking garb & gear I have now. Not only did I survive, I had a fantastic time. 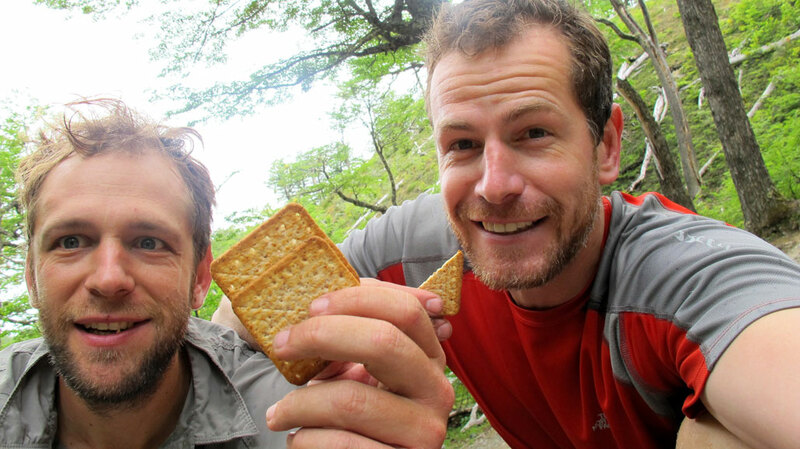 And spare a thought for the Sourdough Expedition crew who endured far worse circumstances with only the bare minimum! One should find the balance between the things needed and the physical toll of a heavy backpack. As a rule of thumb, your backpack weight as a percentage of your body mass should be below 30% for males and 20% for females. 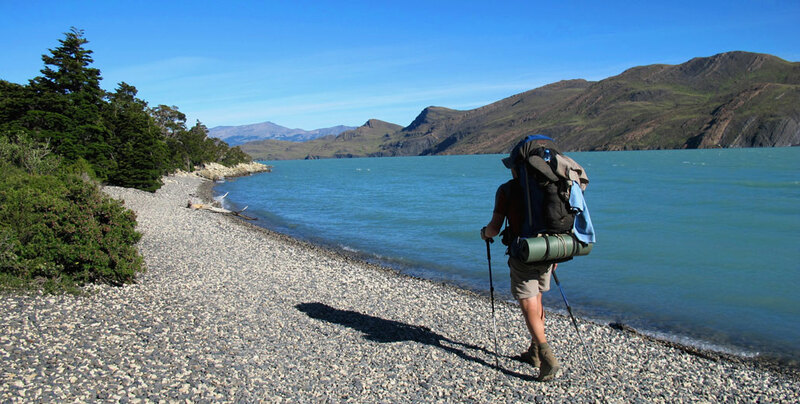 To help you pack, check out our recommended checklist for multi-day hikes. Venturing into the wilderness requires some preparation, but once there the trail will give far more than what it asks. Enjoy! 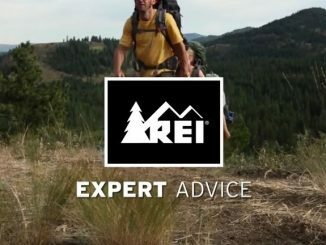 Some very basic, but very helpful guidelines on how to pack a backpack from the experts at REI. Also check out our Multi-day Hiking Checklist to make sure you don’t leave any essentials behind.